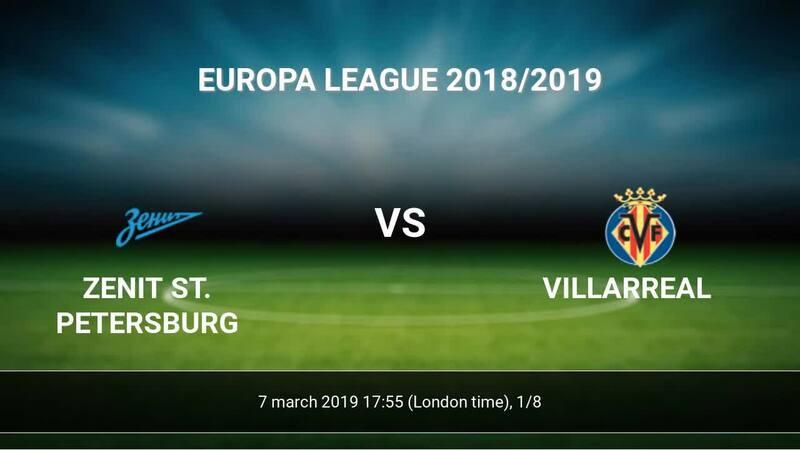 Kick off Zenit St. Petersburg-Villarreal in Europa League on today 17:55. Referee in the match will be Gianluca Rocchi. Zenit St. Petersburg takes place, which promoted to the European cups. Form team looks like this: In the last 5 matches (league + cup) gain 0 points. 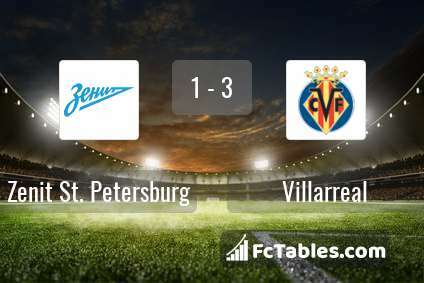 To defend Villarreal the most demanding players will be Artem Dzyuba 4 goals, Robert Mak 3 goals, Anton Zabolotny 2 goals, because this season they scored the most goals for Zenit St. Petersburg of the entire composition. Players with the most assists: Artem Dzyuba 3 assists, Anton Zabolotny 2 assists. Injuries in the team Zenit St. Petersburg: Claudio Marchisio, Aleksandr Yerokhin. Villarreal takes place, which promoted to the European cups. In 5 last games (league + cup) Villarreal get 0 points. Players Villarreal in Europa League with the highest number of goals: Karl Toko Ekambi 3 goals, Pablo Fornals 3 goals, Gerard Moreno 2 goals. Players Karl Toko Ekambi 3 assists, Pablo Fornals 2 assists will have to be very well guarded by defenders Zenit St. Petersburg, because they have the most assists. Injuries in the team Villarreal: Manuel Trigueros, Bruno Soriano, Daniele Bonera. Direct matches: Villarreal won more direct matches. 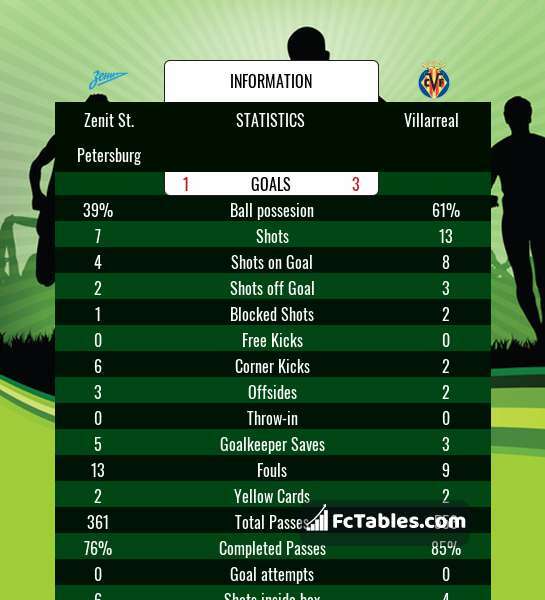 Zenit St. Petersburg won 1 matches , Villarreal won 1 direct matches, was a 0 draws. In 1 matches the sum of the goals both teams was greater than 2.5 (Over 2.5), and 1 matches teams scored more than 1.5 goals (Over 1.5). In 1 matches the both teams scored a least one goal (Both teams to score).